Proof that you can be beautiful and hardworking: Use a well-designed folder for your next project for the ultimate in sleek efficiency and polished good looks. 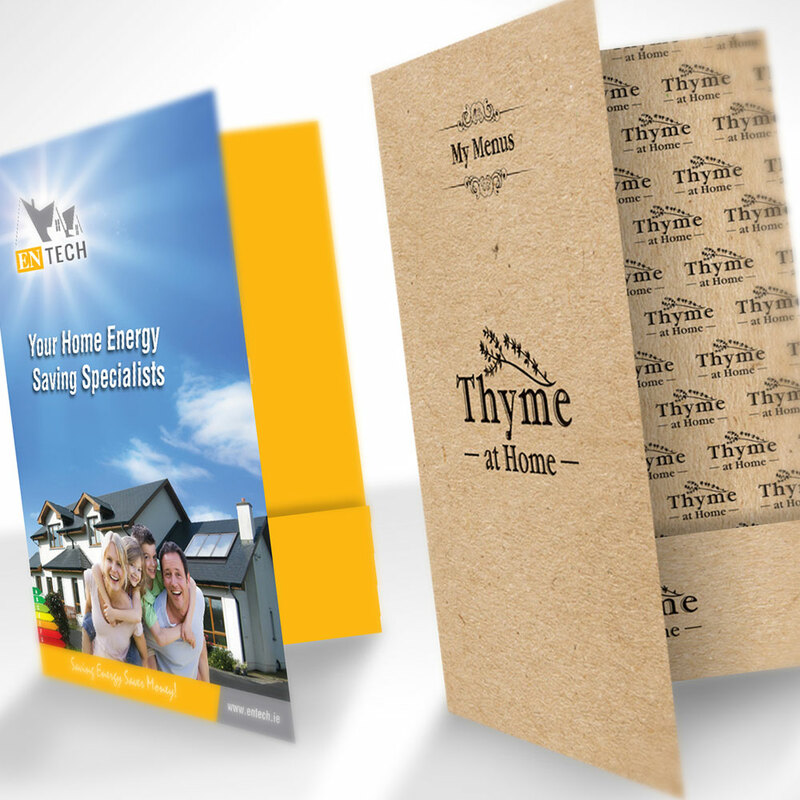 By ordering folders in full colour on heavy 350gsm card, you can enjoy the edge at your next presentation or tender. Choose between matt or gloss lamination for subtle superiority in both look and finish. Unleash your creativity with bespoke shapes and unique features – gloss varnish for your logo, anyone? You decide what you want for your folders, and we can design and deliver it for you. Example of gloss varnish applied to a logo below. Proof that you can be beautiful and hardworking: Use a well-designed folder for your next project for the ultimate in sleek efficiency and polished good looks. By ordering folders in full colour on heavy 350gsm card, you can enjoy the edge at your next presentation or tender.Choose between matt or gloss lamination for subtle superiority in both look and finish. Unleash your creativity with bespoke shapes and unique features – gloss varnish for your logo, anyone? You decide what you want for your folders, and we can design and deliver it for you. Example of gloss varnish applied to a logo below.Important information: We supplied the printing flat, with interlocking flaps for easy assembly. You can also choose glued flaps, they arrive to you assembled and ready to go. When you choose to get your folders glued and supplied assembled, the gluing is for one location to suit our die shape. If you purchase a unique die to your folder, additional gluing points may be required, we will quote you for this work. Presentation folders are cut to shape. You can choose one of our existing shapes for free. Alternatively if you would like your own unique cut out shape for your folders, please allow €199/£149 (approx) as we have to manufacture a die to cut out the folder shape (please allow 5 days for a new die to be created).